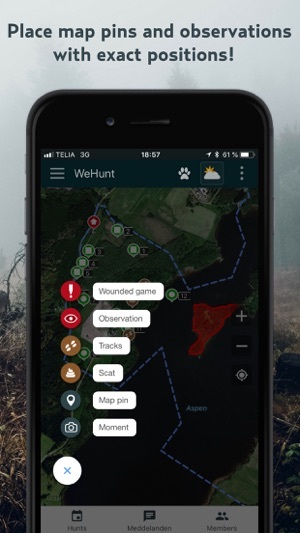 Create your hunting ground, allowing you to set boundaries and place pins directly in WeHunt’s map function. Start the hunt, then follow the members of your hunting party and dogs on the map in for enhanced safety. Send voice messages or chat silently with the hunting party. Create a hunting area with area borders, stands and share them with your hunting team members. All hunting team members can share the administration of your land, and you can easily invite others to the hunt with just a few clicks. Chat silently with your entire hunting team or with separate hunting companions while hunting. Indicate shot wild game, observations or tracking. 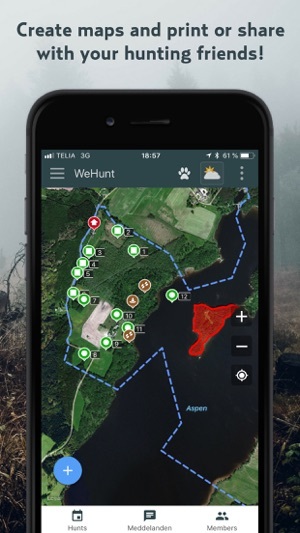 WeHunt's Hunting Diary saves finished hunts with information about the area, the time and the events that take place in the form of trapped animals, captured images and observations. 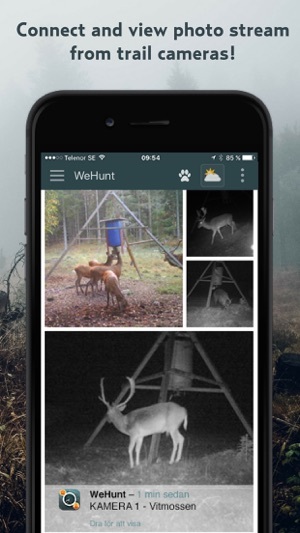 WeHunt helps the Hunting Leader by allowing you to record and store your hunting documents. By setting the expiration date for the hunting license and insurance you will be reminded if any of the documents are about to expire. Easy management of hunting grounds and delimited areas with our web-based mapping tool where you among other things can print the hunting map in high resolution with no cost and import pushpins from GPX-files. Contains map data from Danish Styrelsen for Dataforsyning og Effektivisering (Kort25, WMS-service and property borders, WMS-service), Norwegian Kartverket, Finnish Lantmäteriverket, and Swedish Lantmäteriet. 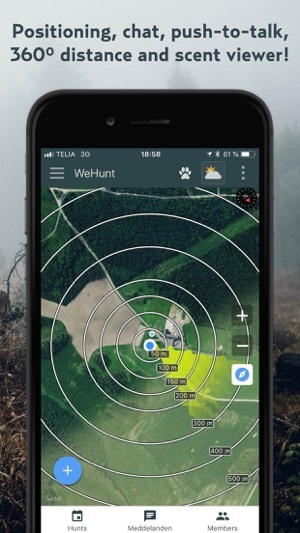 WeHunt 4 makes your hunting experience easier, safer and more enjoyable!